The longer we live in a home, the more junk we accumulate. Stuffed closets, crammed cabinets, and a basement jammed full of clutter quickly become commonplace. Not only does clutter look messy and unappealing but it also takes away valuable space. Our sectional closets provides organization that will keep your storage areas in line with the quality of the rest of your home. 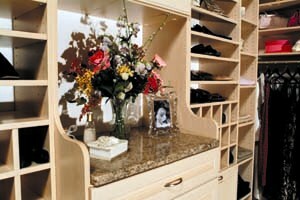 The Closets Works understands that each part of your home has unique organizational requirements. Therefore, we custom design each system to fit your specific needs and maximize your space. This is why our superior quality storage solutions have made us the leader in the industry. Our professional staff would be most pleased to study your available space, analyze your specific needs and desires and then design, manufacture and install a highly functional and extremely flexible storage system that is uniquely yours.